The pamphlet in this month’s box has info about the nutritional benefits for my snacks. 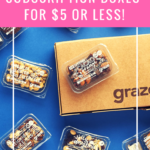 On the bottom are some coupon codes to share with friends, so when they subscribe, they can receive their first and 5th Graze box for free. On the back is all of the listed nutritional information for each snack. Also included was this promo card for Oriental Trading. Few times have I enjoyed snacking on straight-up seeds, but this mix of sunflower and pumpkin seeds was divine. Lightly sweet with a welcoming vanilla flavor, this blend was one I couldn’t put down until every last bit was finished. Seriously—I took a spoon to the container and just didn’t stop. A very strong start to this month’s box! Ooh, this little trio was so good! An updated recipe from a 30-year-old British bakery, these mini bars combine rolled oats with dried apricots, dates, pumpkin seeds, and more to deliver a wholesome, hearty flavor with a hint of natural sweetness. These would make for an excellent morning snack, had I not scarfed them all immediately. This offering was so new, I couldn’t find it on Graze’s site quite yet. Mixing pear pieces, pumpkin seeds, cranberries, and almonds to provide fiber and a source of vitamin E, this snack was a nice intersection of healthy and lightly indulgent. The hint of vanilla was quite enjoyable as well. What a satisfying way to handle a sweets craving! This cobbler mix features peach fruit drops with a wonderfully concentrated flavor, almonds, yogurt seeds, and amaretti drops. I was most impressed by the amaretti drops mimicking the taste and texture of a delectable crust. This one was super fun. It looks like this pack is going by a new name, as the original was “Super Forest Fruits.” The ingredients (blueberries, lingonberries, soft apple pieces, and cherry-flavored raisins) are still the same, though. I happen to love dried fruit, especially raisins, so this was another win for me. The apple pieces were softer than I had anticipated, but I enjoyed them nonetheless. Upon opening the package, I immediately smelled the raspberries. The shredded coconut, amaretti drops, and almonds were a nice blend and made this snack feel more like a dessert than a healthy treat. Well done with this one, Graze! A favorite of one a Graze nutritionist, this pack offers cherries, pears, and walnuts for a boost of copper and manganese for energy. I really appreciated the chewiness of the fruit against the crunch of the walnuts. It’s a nice, basic mix. I saved this one for last because I tend to snack on the savory side, and wanted to end this review on a high note. The mix of roasted sour cream and onion cashews, mustard breadsticks, and poppyseed pretzels had a familiar taste to some of my favorite lunchbox snacks as a kid. I went through this one about as quickly as the vanilla seeds, and wished I had more! Verdict: This was my first time trying Graze and I must say, I am impressed. At first, I felt a little daunted because I tend to prefer savory snacks, of which there was only one in this box, but I thoroughly enjoyed every single offering. My favorites include the vanilla seeds and the sweet mustard ranch mix. For $1.75 per snack, this was absolutely worth it for me, as each snack had a lot of personality, with the added bonus of being healthy. 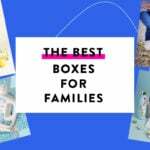 I went to sign up using the provided link & my first box isn’t free, only half off. You might want to change this article if they’re no longer doing that promotion. I’m not sure what the issue is. Thanks! Thanks for the heads up, Heather. I’ll pass that along! I had a subscription to Graze when they first started and my favorites were the flapjacks, flavored nuts, and the savory snack mixes. I’m trying to eat healthy again, so I may need to subscribe again. Graze snacks taste so much better than they look. I spent like $70 in their shop so far after trying the first box I got. The flapjacks, smoothie deconstructions, prezals dippers, and dried fruit mixes are my favorites.